As part of an overall recovery plan following the detection of the Intel® 6 series chipset design error, ASUS has implemented various customer support measures, including extensive product replacement and return with additional service hotlines around the world. Based on new information from Intel®, ASUS is happy to announce that updated Intel® 6 series-based motherboards will begin shipping this week*, immediately after the revised design is released by Intel®. This fast response aims to prevent any further inconvenience and interruption to customers. 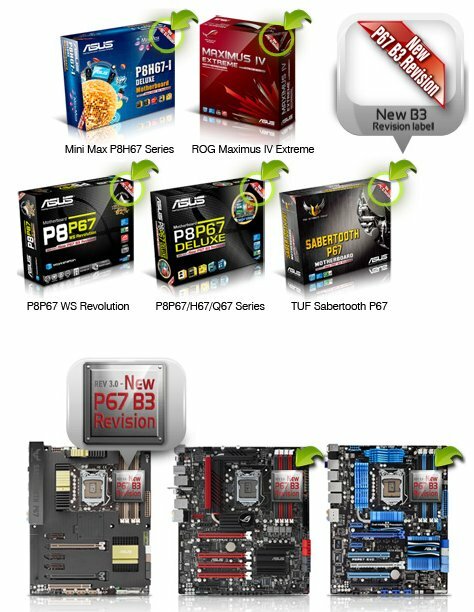 Customers who already own potentially affected motherboards may visit http://vip.asus.com/eservice/changeSand ... uage=en-us for product return and replacement details. Additionally, users can easily identify revised products by checking for labels showing “New B3 Revision” displayed on products and their packaging. The chipset version can also be verified through the onboard sticker, BIOS, ASUS SATA Verifier or CPUID’s CPU-Z utility. We would like to use this opportunity to encourage any current users in possession of affected ASUS products to carry out return and replacement promptly, so that the transition to the revised hardware is as smooth and fast as possible. For additional information and assistance, please feel free to contact your local ASUS service hotline.